The Great Barrier Reef, a United Nations Educational, Scientific and Cultural Organization (UNESCO) World Heritage site located on the northeast coast of Australia, was surprisingly absent in a report on climate change published earlier this year. Titled World Heritage and Tourism in a Changing Climate, the report was published by the Union of Concerned Scientists, the United Nations and UNESCO. The omission was made at the request of the Australian government, which contended that there would be significant, negative impacts on its tourism industry if the reef were featured in the paper. Granted, as with many natural places of beauty, the Great Barrier Reef is an extremely important economic asset. It comprises more than 3,000 coral reefs, 600 continental islands, 300 coral cays and about 150 inshore, mangrove islands. It employs more than 69,000 people and generates $5.6 billion for the Australian economy. But right now, this planetary phenomenon is experiencing the worst coral bleaching and dying event in its history. Greenhouse gases that are pouring into the atmosphere from the burning of coal and other fossil fuels have caused water temperatures to become extraordinarily warm. 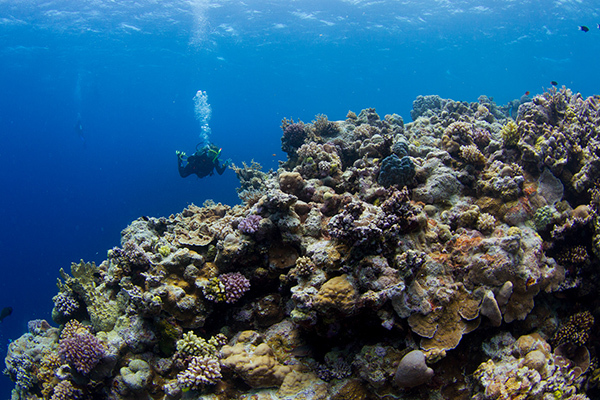 Some of the reefs may lose as much as 90 percent of their corals. And when reefs die, the fish leave, taking with them not only the tourism industry but commercial and recreational fishing, as well. And leaving the Great Barrier Reef out of a UNESCO report on climate change won’t alter—or even hide—that fact. Watch the video below, published on June 8, 2016. In it, Climate Council’s Professor Will Steffen, a climate change expert and researcher at the Australian National University, Canberra, explains how the great reef’s death is an extreme, global event in extent, size and speed with which it is occurring. It is further evidence that climate change is here, and some of its damage may now be irreversible. However, there is still a chance for some recovery. Although most parts of the Great Barrier Reef have been affected by bleaching, not all have died. Researchers, for instance, have found that some adult corals swap their algal partners later in life, which could assist them in getting more heat-tolerant microalgae that could eventually help corals better adapt to global warming. Let’s hope it’s not too little, too late.